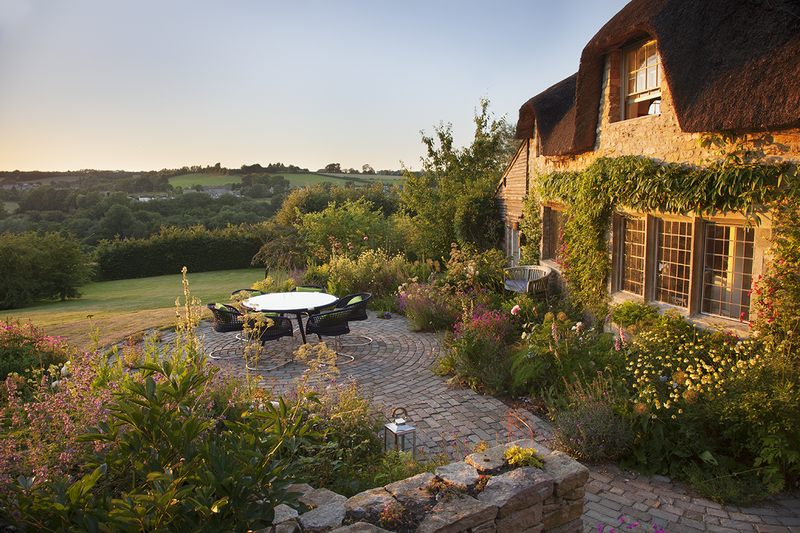 Nestled in the hills south of Bath, the garden of this thatched cottage offers stunning views across the surrounding countryside. The owners, Jane and Andrew, wanted to create a place to relax and asked Tom Eaglestone to come up with a design in harmony with the cottage. For the hard landscaping, Tom advised on sandstone cobbles which he used to create paths and terraces whilst the retaining walls were built with random rubble purbeck stone. Some little pockets have been left untouched for Verbascum spica, Erigeron karvinskianus and marjoram to grow. For the beds, a mix of perennial plants and shrubs were planted, such as Geranium psilostemuum, Agyranthemum, Astrantias, roses and clematis. On a June evening, the whole place glows in a soft warm light.